How does canoe camping differ from backpacking? What camping equipment should I bring on a canoe trip? What's your goal for the trip? How do I pack my boat? How do I portage my canoe? Throughout history, explorers have loaded gear onto rafts, canoes, and barges rather than carry it on their backs. A boat’s buoyancy makes it an ideal mode of travel; paddling forward requires much less effort than lifting a load with each step. For this reason, canoe camping opens up a whole host of options for your backcountry experience that are not possible when every ounce of gear has to be carefully considered. While this can lead to over packing for some, for most, it simply means a more comfortable camping experience. Camping along a waterway is also different from backpacking in that the water “trail” can help (or hinder) you in reaching your destination. Unless you’re paddling a glassy lake, the currents make a big difference in how much time and effort it takes to reach the day’s campsite. In many ways, though, canoe camping is quite similar to backpacking. You’ll still need to watch out for dangerous wildlife, make sure you stay hydrated, and avoid overexerting yourself - canoeing can burn up to 900 calories per hour! You’ll probably still want to roast marshmallows, tell stories around a campfire, and complain about how difficult your tent is to set up. 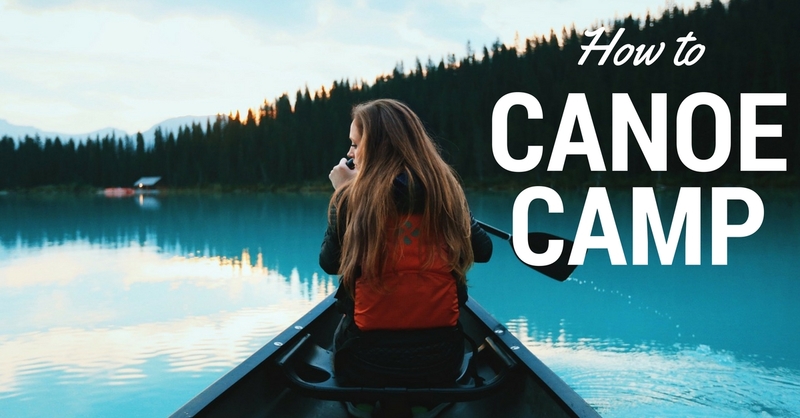 Canoe camping is a great way to enhance your love for the outdoors by trying out a new sport (if you aren’t already a paddler) and injecting some variety into your camping experience. There will be a few differences in planning, but overall, canoe camping is the same type of exciting outdoor adventure you’ve been doing for years. On a canoe camping trip, you usually won’t be able to camp wherever you feel like it. It may be that the shores are privately owned, or if you’re paddling in a wilderness area, you might be required to camp at designated sites. Either way, careful planning is required so you can comfortably reach your destination at the end of each day. A good guideline for the maximum distance you can paddle in a day is 10 miles on flat water and 15 miles on a gently flowing river. Rivers with particularly strong currents might allow up to 30 miles in a day. Check the flow rate for the river (available from USGS) to get an accurate calculation, but always err on the side of a conservative estimate. Once you’ve calculated how far you can travel each day, get a detailed topographic map (or guidebook for the waterway) to find out where camping is possible. At this point, note whether you have to make any portages, especially around rapids or waterfalls. These will reduce the distance you can travel on those days. Now that you know the location of the campsites, use the distance tool in Google Maps to measure the spaces between the campsites (this is much easier than using a ruler on a map). Using your maximum daily distance, you can determine which campsites will be best for your trip. Remember how I said you can bring more gear when canoe camping because you won’t need to carry it on your back? That extra weight will come back to bite you during a portage, so you might want to reconsider your packing list if your route requires one. Portages aside, since you’re not limited by the amount you can comfortably carry on your back, you can bring more luxury items on a canoe camping trip and upgrade some of your standard camping equipment. You’ll probably want to bring better foods that have more extensive storage and preparation requirements. Depending on the length of your trip, you might choose to bring a cooler filled with ice or gel ice packs. They’ll only last a couple days, but will let you have some great food during that time. For breakfast, a cast iron skillet is invaluable for making pancakes, hash browns, and bacon. Lunch might consist sandwiches or wraps with vegetables and cold cuts. Macaroni and cheese (with real cheese) is a great dinner option while camping. More comfortable sleeping conditions are another way canoe camping can upgrade your outdoor adventure. Pack the multi-room tent you would for car camping, along with an inflatable mattress. This is also a time to break out some of the accouterments that normally wouldn’t fit in your backpack, like a hammock, camp shower, and a portable toilet. None of this is to suggest that you bring the kitchen sink just because you have a canoe, but you won’t need to be as concerned about weight as you would on a backpacking trip. That might seem like a strange question, but it’s actually something you should be asking yourself for every outdoor adventure. Is the purpose of the trip to see a certain destination, reconnect with friends and family, enjoy nature, get a vigorous workout, or engage in an activity you love (fishing, orienteering, etc.)? Getting clear on your goals and confirming that they’re shared by your camping companions will lead to a more enjoyable trip. If your friends would rather have time to fish instead of paddling all day to reach your favorite camping spot, there’s going to be some disagreements and resentment. But when everyone’s on the same page, everyone’s having more fun. Knowing your goals for the trip will also help with the packing process. If there are only a couple hours in the evening to go fishing, bring a more minimalist tackle box. If people want to eat well, bring some gourmet ingredients for your meals. For the most part, this is an easy question – wear whatever you’d like, so long as you’re comfortable. A simple outfit of shorts and a t-shirt or tank top will do just fine. You should always wear a PFD (personal flotation device), especially if you’ll be paddling through rough waters. Just remember to put sunscreen on any exposed skin and reapply it every few hours, especially if you get in the water. Footwear is the most important consideration for canoe camping, because unlike with hiking, you can be relatively certain your feet are going to get wet. You may have to portage, use them to push off of a rock, or just walk through a riverbed to pull your boat ashore. Many canoeists choose hiking sandals like Chacos or Tevas, which fit snugly and usually have a back strap to prevent them from falling off. They’re unlikely to break or fall off, even under tough conditions, and your feet will dry out quickly once you’re back in the canoe. Others choose standard hiking footwear like boots or sneakers, paired with wool socks. These will leave your feet wet for longer, but you can always take them off in the boat and let them dry out in the sun. The advantage of hiking shoes or boots is that they’ll provide more ankle support and better protection if you need to do a lengthy portage. Flip-flops are never a good choice for canoe camping. They provide no ankle support and little traction, and can easily fall off and float down the river. A camping trip without shoes will probably be the last one you ever go on. Packing a canoe requires a little more forethought than packing up the station wagon for a camping trip. You’ll need to be able to protect all of your gear from the water you’re paddling through, and from the elements in general. Weight matters, too; if the boat is too loaded down, it will be much harder to paddle. Any electronics you’re carrying (phone, GPS, Bluetooth speaker) absolutely must be packed inside a waterproof dry bag, preferably one made from vinyl rather than thin fabric. It’s actually a good idea to pack any equipment that doesn’t dry out easily, like a down sleeping bag, in dry bags. When it comes time to load your gear into the boat, you’ll need to properly balance it. Putting too much weight in the ends is detrimental to the boat’s handling, and you definitely don’t want all the weight in one end. Most of the weight should be in the center, and everything should be packed below the gunwales (the upper edge of the canoe) to lessen wind resistance and keep it as dry as possible. There’s no way around it, portaging a canoe and a bunch of gear is going to be unpleasant. The best option is to plan a route without any portages, but if that’s not possible, there is a right and wrong way to do it. The first step is to unload the boat. If you’ve packed properly, with most things in easy-to-carry dry bags or backpacks, this won’t be much of a problem. If all the gear is just loose in the hull, though, it will be a terrible experience. So many people seem to think you should do a two-person carry to the put-in point. But unless the trail is completely flat, nothing could be further from the truth. Two people carrying a canoe is inefficient for two reasons: you have to carefully coordinate your movements over uneven terrain (which is likely to end in an argument), and an unloaded canoe is not heavy enough to justify this. Instead, have one person carry the boat and one person carry the supplies. The best method for carrying the canoe is to lift the boat upside-down onto your shoulders. The canoe should come with a yoke that will sit behind your neck and across your shoulders, leaving your arms free to balance the boat if need be. This is one of the most asked questions about canoe camping – capsizing a canoe on a daytrip can certainly be annoying, but it’s a much bigger issue on overnight trips, when your tent and three days worth of food could end up floating down the river. Whether capsizing causes a crisis will depend on how the gear was packed. Let’s say you did everything right, placing your electronics and must-be-dry camping equipment in dry bags. Immediately after capsizing, coordinate with your paddling partner; one of you should prevent the gear from floating downstream, while the other secures the boat. Then if it’s feasible, swim to shore. If you’re too far from the shore (like out on a large lake), you’ll need to flip the boat back over. Swim underneath the middle of the canoe, and press up on the hull. Once your partner has secured the gear on the shore, have them pull the edge of the boat to one side to flip it over. There will likely be some water left in the boat once you get it turned back over, so you’ll have to bail it out or paddle it to shore partially filled. If your boat does capsize, the most important thing is to not panic. Thinking clearly throughout this ordeal will ensure that you can stay safe and salvage more of both your gear and your outing. There’s nothing quite like packing up a boat and setting off for a few days of adventure and relaxation in the wilderness. With a canoe, you can take a lot more with you, which makes it a bit like car camping – but with the opportunity for a lot more solitude. Having extra storage space means your trip can be filled with gourmet food, fun camp games, and more comfortable sleeping supplies. Don’t go overboard with the packing, though, because all of that stuff will need to come out of the boat, be it at the end of the day, during a portage, or in the unfortunate event of a capsize. Canoe camping requires a bit more preparation than a backpacking trip, since water adds new hazards. But it can also mean a much easier trip if you use the river currents properly. As with any camping trip, have fun and enjoy nature! 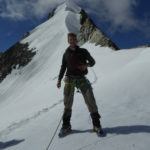 Kieran Cunningham is a Scotsman based in the Italian Alps. He’s a climber, mountaineer, trekker and all-round lover of all things high and rocky. He’s climbed extensively in the Himalaya, Rockies and Alps but is just as happy roaming the Scottish Highlands, exploring canyons in Utah or messing about at the local crag.